The Flying Classroom, an interactive STEM+ learning adventure, launches today from Ronald Reagan Washington National Airport. National Geographic Emerging Explorer Captain Barrington Irving, who holds the Guinness World Record as the youngest person to fly solo around the world, will pilot the jet Inspiration III to North America, Asia, Indonesia and Australia. Along the way, he and his crew will explore real-life applications of science, technology, engineering, mathematics, history, geography and the humanities. The Inspiration III crew will take 16 ground, air and sea expeditions, and an online portal originating on board the plane will share videos and a real-time storytelling blog with students around the world. Inspiration III will travel to all seven continents over three consecutive school years. 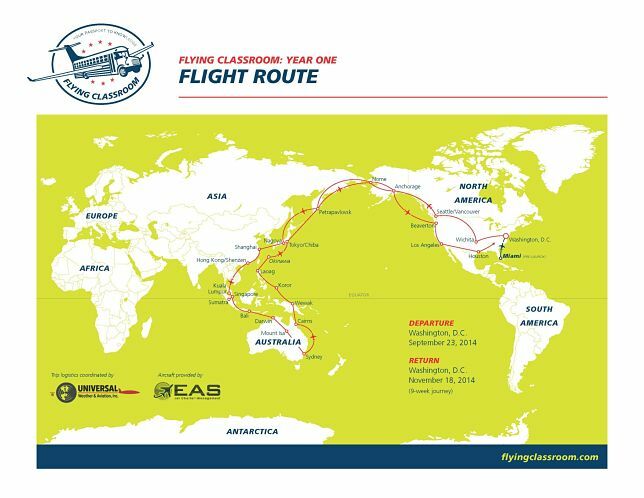 Students in schools that use the Flying Classroom curriculum, which is aligned to the Common Core State Standards and Next Generation Science Standards, will study STEM+ subjects relevant to each expedition as they track the Flying Classroom team. In Montana, for example, Captain Irving will meet a chef with a bionic arm and see how the human brain can control robotic limbs. In Australia, Captain Irving will illustrate how to balance an ecosystem by eradicating a poisonous toad. In Palau, he will track poisonous snakes to extract life-saving venom. Challenges during each journey will invite students to solve problems that may lead them to discover a career path in STEM+. Teachers and students can follow Irving from today through Nov. 18 on the website, via Facebook or on Twitter at @CaptainIrving and using #flyingclassroom.